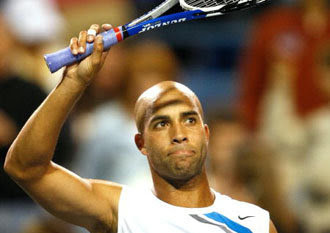 Yesterday's gloomy weather did not dampen the red hot game of James Blake. In pursuit of holding the New Haven title for a second time, he previously won it in 2005, the No. 3 seed followed a very successful week in Cincinnati by continuing his history of perfection over Arnaud Clement of France. In seven meetings Clement has been defeated every time. Blake won by a score of 6-4, 6-2, within which he hit 6 aces, 2 double faults, and had a 57% first serve rate. He also broke Clement's serve 6 times in a match that lasted only 1 hour 15 minutes. Next up, Blake's third round opponent will be the winner of the match between American Robby Ginepri and Agustin Calleri of Argentina. The matches to be played by Gael Monfils and Donald Young were washed out by east coast storms. Both are on tap for play today.